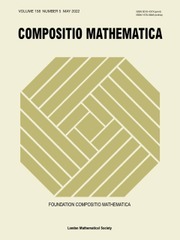 Compositio Mathematica is a prestigious, well-established journal publishing first-class research papers that traditionally focus on the mainstream of pure mathematics. Compositio Mathematica has a broad scope which includes the fields of algebra, number theory, topology, algebraic and differential geometry and global analysis. Papers on other topics are welcome if they are of broad interest. All contributions are required to meet high standards of quality and originality. The Journal has an international editorial board reflected in the journal content. In recent years, applied analysis has seen an increase in interest in neural networks.